The California-based SpaceX on Friday became the first commercial outfit to send its own unmanned cargo capsule to the ISS, heralding the start of a new era for private spaceflight after the end of the 30-year US shuttle program. Shortly after the hatches between the ISS’s Harmony node and the Dragon spacecraft were opened at 5:53 am EDT (0953 GMT), astronauts ventured in to the unmanned capsule for the first time. "Like the smell of a brand new car," said US astronaut Don Pettit, who on Friday was the one who reached out with the station’s robotic arm and snared the Dragon as it approached the research outpost. Wearing protective face masks and goggles, Pettit and station commander Oleg Kononenko, a Russian cosmonaut, entered the Dragon to get a first look at the inside of the new craft and the more than 1,000 pounds of cargo it carried. The two were joined at the entrance of the hatch by European Space Agency astronaut Andre Kuipers and Russian cosmonaut Gennady Padalka, SpaceX said in a statement, adding that "Dragon’s interior looked good." "The ship is in good shape," said a NASA commentator. A news conference with the six-member ISS crew is scheduled for 11:25 am EDT (1525 GMT). Now that the doors between the two spacecraft are open, the crew is starting four days of work to unload and restock the world’s first commercial resupply vessel with gear to return to Earth. The Dragon has toted 521 kilograms (1,148 pounds) of cargo for the space lab, including food, supplies, computers, utilities and science experiments. It plans to return a 660-kilogram load to Earth. That means SpaceX and its competitor Orbital Sciences Corporation would likely become the chief cargo servicers of the $100 billion space station, which is set to remain operational until 2020, NASA said. SpaceX has a $1.6 billion dollar contract with NASA to supply the station over the coming years, and Orbital Sciences has a $1.9 billion contract to do the same. Orbital’s first test flight is scheduled for later this year. SpaceX and a handful of other companies are also competing to replace the crew capability that the United States lost when the shuttle program ended. SpaceX’s Dragon was built to carry not just cargo but up to seven humans to the ISS. 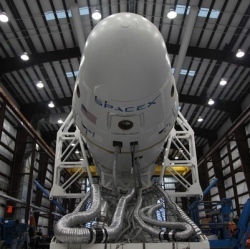 The company, owned by Internet entrepreneur Elon Musk, says it aims to begin taking humans to the space station by 2015. In the meantime, the world’s astronauts must rely on Russia’s Soyuz craft for ISS transport at a cost of $63 million per seat.